In a strata development, the term common property (CP) is, shall we say, common? According to the Strata Management Handbook by the Real Estate and Housing Developers’ Association’s (REHDA) Institute, common property refers to the development area that is not included in any parcel or accessory parcel and is capable of being used or enjoyed by two or more strata unit owners. These areas include the corridors, landscaped areas and gardens, swimming pools, gymnasiums and meeting rooms which is where the maintenance fees you pay monthly go, towards the upkeep of these facilities. However, more and more mixed developments now exist where developers claim that people can live, work and shop/play, all within the same building complex. Hence, a mixed development would have residential blocks, office towers, a retail mall or shops and a hotel all rolled into one. While it all looks great on paper, because to live with every convenience at your doorstep has a wonderful ring to it, the reality is that being a resident in a mixed development does not mean you can use or benefit from the parts of the development other than the residential portion. 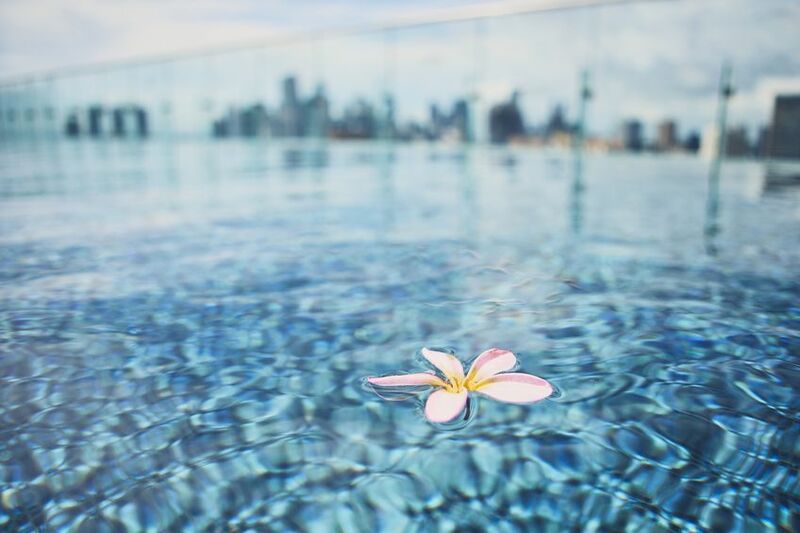 For example, if there is an Olympic-sized swimming pool on the rooftop in the office tower next to your residential building, residents will not be able to access and utilise the swimming pool and can only look on in envy at the tenants of the office tower. This has given birth to the term Limited Common Property (LCP). According to REHDA Institute’s handbook, LCP is referred to in Section 17A of the Strata Titles Act 1985 as the part of the community that is designated for the exclusive benefit of two or more, but not all strata unit owners; and for which a certificate has been issued by the Director of Land and Mines certifying that a Subsidiary Management Corporation (Sub-MC) has been constituted under the Strata Titles Act 1985. This means that the Management Corporation (MC) may designate the LCP and create one or more Sub-MCs for the purpose of representing the different interests of the parcel proprietors by a comprehensive resolution under the Strata Management Act 2013 (SMA). According to Malaysian Institute of Property and Facility Managers (MIPFM) president Faizal Fuad, one of the pertinent problems when it comes to managing a mixed development is the distribution of cost in maintaining the common property of different development components. “Some owners feel that they do not use or enjoy the use of the shared property, and wonder why they have to bear the cost when they do not use it (the facility). There are also owners who feel that other owners are not entitled to enjoy the shared property in their building blocks and want to control the financial accounts of their neighbourhood independently,” says Faizal. 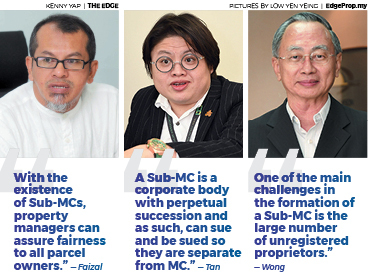 Thus, Faizal says, with the existence of Sub-MCs, property managers can assure fairness to all parcel owners. are better managed,” Faizal explains. Chur Associates founder and managing partner Chris Tan tells EdgeProp.my that a Sub-MC will act as a separate legal entity that will keep a separate account of incomes and expenses. “A Sub-MC is a corporate body with perpetual succession and as such, can sue and be sued so they are separate from the MC. Its duty is to manage its own maintenance charges and sinking fund accounts, all of which must be audited annually by an independent auditor. They are also tasked with properly maintaining and managing the limited common property, and to keep it in a state of good and serviceable repair. “Therefore, it will be a benefit to form a Sub-MC for the ease of maintaining and managing its own limited common property. Sub-MCs may manage and maintain the LCP freely without the need to get all owners involved, but only the owners who benefit from the LCP. The owners who are not enjoying the LCP are not required to bear service charges incurred in the LCP,” Tan explains, adding that the concept of a Sub-MC is arguably introduced to resolve the complications in managing a mixed-use integrated strata development. However, Burgess Rawson Malaysia group managing director Wong Kok Soo warns that there are some disadvantages to having Sub-MCs in a strata scheme. “There will be more general and committee meetings carried out by both the MC and Sub-MCs. This also leads to more invoices, receipts and accounts by both parties. The overall charges and sinking fund contributions will increase due to the increased number of general meetings, committee meetings, accounts and auditing collectively for the MC and Sub-MCs. mixed-use strata scheme,” Wong points out. If the Sub-MC is indeed the best way to manage a mixed development, why then has no Sub-MC been formed yet in Malaysia? According to Burgess Rawson’s Wong, one of the main challenges in the formation of a Sub-MC is the large number of unregistered proprietors which often leads to an insufficient number of valid votes to reach two-thirds of the aggregate share units needed to form the Sub-MC. “Four years since the Strata Titles (Amendment) Act 2015 and the SMA came into force in June 2015, no Sub-MC has been formed. This is because some purchasers of a strata property have yet to register for their strata titles while others who have registered may not be entitled to vote because they have not paid their maintenance charges. “On top of that, there is a lack of a standard strata roll update (a computerised print out providing the updated details on the names of the registered proprietors, their parcel numbers, their share units and the date of registration of each proprietorship with respect to each parcel) from some land officers, which hinders the voting process. For example, an irate management body mentioned that a certain land office only printed out the parcel numbers without the name of the proprietors,” Wong laments. This was an example given in reference to problems faced in 2018 with land offices in Negeri Sembilan. MIPFM’s Faizal points out another problem – ignorance. Some parcel owners, he says, may not know that they have to cast their vote within a 60-day period after the Extraordinary General Meeting (EGM). “It is imperative that parcel owners know and understand their responsibilities and come forward to cast their votes,” says Faizal. Chur Associates’ Tan also notes that whether the management of the different components of a mixed development is easy or difficult, depends on its design. “The original DNA of the building must be such that the different parts are designed to be able to be easily separated and managed differently. “If it is designed as a pair of ‘Siamese twins’, it would be challenging to craft out LCPs,” says Tan. Under the existing Strata Titles (Amendment) Act 2015 [Act A1450], only the MC can approve a comprehensive resolution to demarcate the LCPs and form the Sub-MCs. However, Burgess Rawson’s Wong raises the concern that the MC and its management committee may be ill-equipped to handle the demarcation of LCPs for the formation of Sub-MCs because it involves matters such as whether the electric supply installation, water reticulation system, M&E installation, plant and equipment facilities can or cannot be segregated for the proposed LCPs. “Furthermore, it also involves the application of the exclusive use test on such installations, plants, equipment and facilities as well as the designated parts of the common property. The MC has to allocate a substantial amount of monies to engage a specialist licensed land surveyor and a specialist property management consultant for the formation of the Sub-MCs,” Wong explains. Thus, he made a proposal to the government in 2018 on behalf of the Association of Valuers, Property Managers, Estate Agents and Property Consultants (PEPS) and REHDA for the formation of Sub-MCs to be carried out by the developer and its project team (licensed land surveyor, architect, civil and structural engineers and mechanical and electrical engineers) as well as the property management consultant as they will be in the best position to come up with suitable LCPs. “It is much easier for the developer as only one single entity gets to decide upfront at the planning and design stage of the development, instead of having so many parcel proprietors of diverse interests deciding at the MC stage. “Furthermore, there is a substantial cost saving without any financial burden to the MC if the LCPs and Sub-MCs are identified and established at an early stage of the Schedule of Parcels (SiFUS),” Wong notes. He says if the proposal to have the establishment of the Sub-MCs in the early stages at the SiFUS is accepted by the Department of Lands and Mines (KPTG) and the Ministry of Housing and Local Government (KPKT), then a series of amendments to the relevant laws, namely Strata Titles Act (STA) 1985, Strata Management Act (SMA) 2013, and Housing Development (Control and Licensing) Act [HDA] will have to be drafted. “The proposed new amendments will need to improve for the MC to amend the LCPs and Sub-MCs as and when necessary via a comprehensive resolution. Said amendments to the regime of laws will take time and possibly come into force in 2021 if KPTG and KPKT can jointly form a drafting committee to start work immediately,” says Wong. At the end of the day, Chur Associates’ Tan stresses, good property management is the key to preserve and increase the value of any property moving forward, especially integrated mixed-use development where there is direct impact among components. “Owning a well-run residential unit on top of a badly run retail mall is certainly not an ideal situation for both owners and investors. While there are laws and regulations in place, common sense and communication among the owners are crucial in community living,” Tan concludes. This weeks cover story on Sub-MCs includes an article on the first Sub-MC that will be ready soon, read it here. This story first appeared in the EdgeProp.my pullout on April 12, 2019. You can access back issues here. Are you overpaying your maintenance fee?